Area fire crews assess building safety and damage. 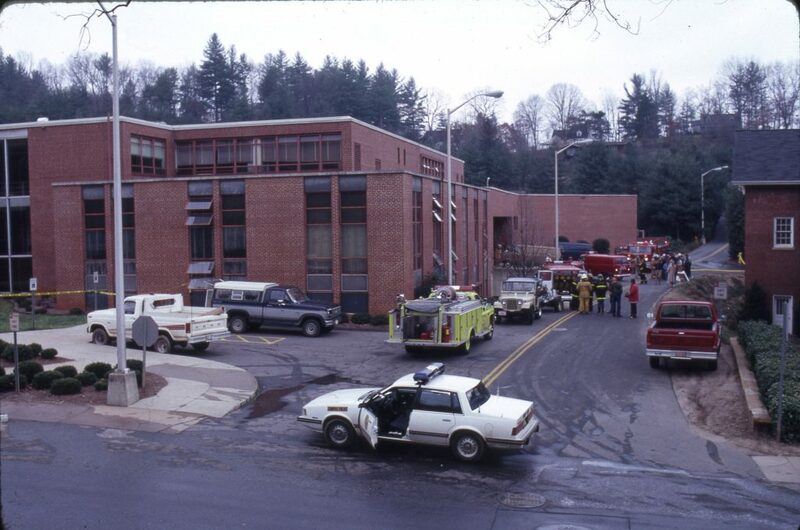 This year marks the 30th anniversary of the Hunter Library fire that started Sunday morning, February 26, 1989. The fire originated in the Media Center, which housed the library’s audiovisual equipment as well as the film, video, and compact disc collections. This area is now the HL 186 library classroom and virtual reality room near Java City. The library building closed for two months while clean up took place. Restoration costs were estimated to be more than $1 million dollars. 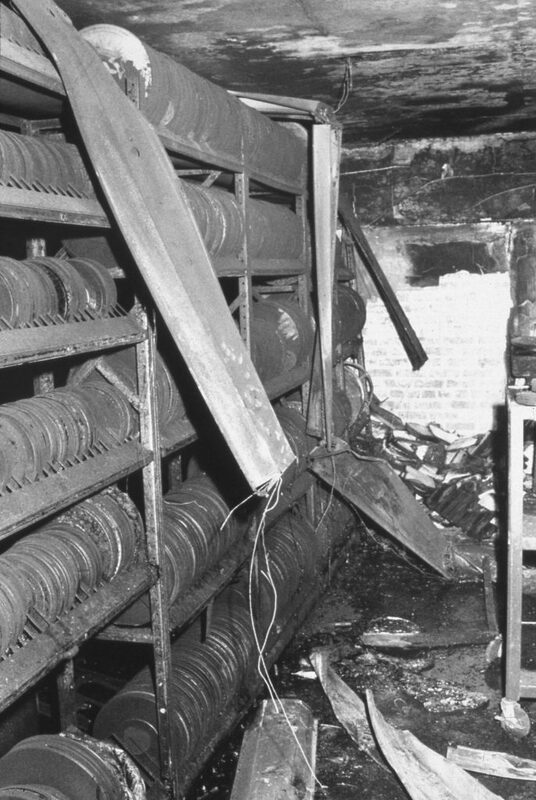 Film collections damaged in the fire. The Media Center, Writing Center, and Faculty Center for Teaching Excellence were temporarily relocated to other campus sites until building reconstruction was completed. Makeshift services desks for circulation, reference, reserves, and interlibrary loan were moved to the ground floor. No overdue fines were charged for books borrowed before the fire. Hunter Library reopened on Monday, April 24, 1989, just in time for final exams. For more information about the history of Hunter Library or Western Carolina University, contact Special Collections or browse our digital collections online. Thanks for this story! Fortunately, since this was before the days of e-journals and e-books, it was only the main floor that had to be closed for the two months during the clean-up. I can’t remember exactly, but it was just a week or two after the fire that we opened the doors to the ground floor.